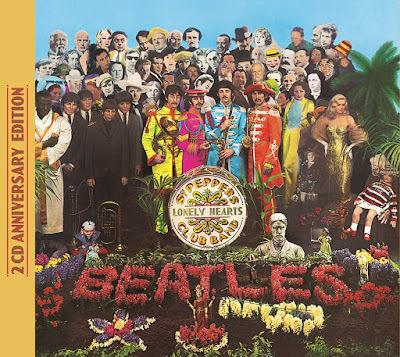 Amazon again jumped the gun a bit when they published photos of the Sgt Pepper items on their pre-order pages a day early. A new stereo mix of 'Penny Lane' and the 2015 stereo mix of 'Strawberry Fields Forever'. Direct transfers of the album's original mono mix and the 'Strawberry Fields Forever' and 'Penny Lane' singles. Capitol Records' U.S. promotional mono single mix of 'Penny Lane'. Previously unreleased early mono mixes of 'She's Leaving Home, 'A Day In The Life,' and 'Lucy In The Sky With Diamonds' (a mix thought to have been erased from a tape in 1967, but discovered during archive research for the anniversary edition). 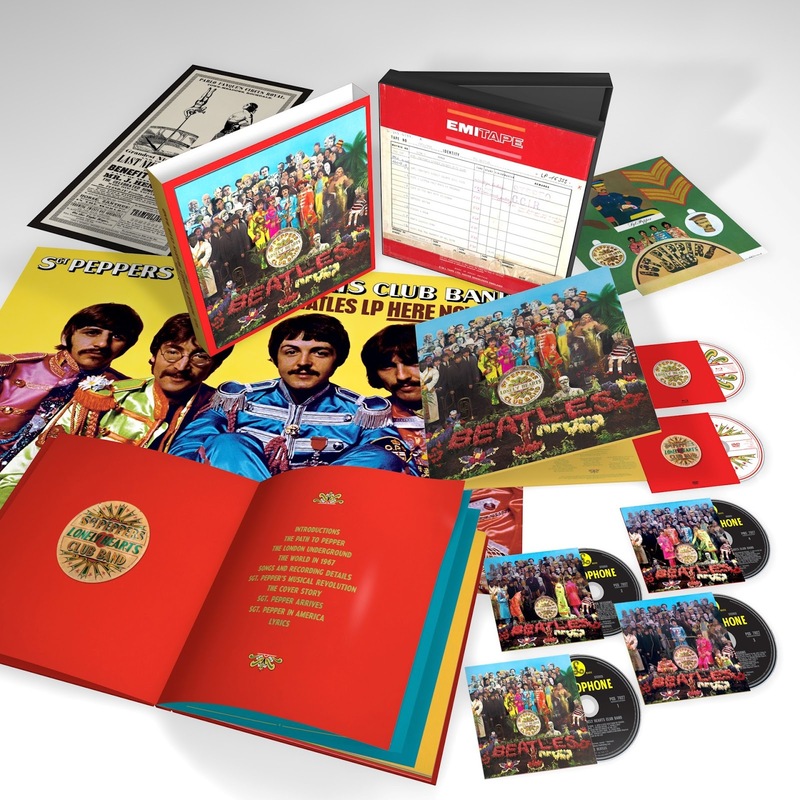 New 5.1 surround audio mixes of the album and 'Penny Lane' by Giles Martin and Sam Okell, plus their 2015 5.1 surround mix of 'Strawberry Fields Forever'. High resolution audio versions of the new stereo mixes of the album and 'Penny Lane' and of the 2015 stereo mix of 'Strawberry Fields Forever'. Video features: 4K restored original promotional films for 'Strawberry Fields Forever,' 'Penny Lane,' and 'A Day In The Life;' plus The Making of Sgt. Pepper, a restored, previously unreleased documentary film broadcast in 1992, featuring insightful interviews with McCartney, Harrison, and Starr, and in-studio footage introduced by George Martin. Double Vinyl album is the new stereo mix on LP 1 and a second LP with previously unreleased complete takes of the album’s 13 songs, newly mixed in stereo. Small samples of course, must say to me the sound is clearer, cleaner, punchier ... and without edge - of all things a bit bland. Could be just me. WOW. Really looking forward to the sessions disc. It sounds great. Love it. The level on the Lovely Rita backing vocals is jarring. I hopes it's not there through the whole song. As the last verse rev up, it' be cool. I'm down for the six disc deluxe version. Good Lord! I need this ASAP! Super Deluxe Edition please. 2CD version for me thanks! Waiting for the White album deluxe edition I'll do the super deluxe on that one. In my opinion The 2009 remasters were disappointing to say the least. The yellow submarine songtrack has been the most superior release to date and so since then we have been waiting for a remix of the Beatles albums. Finally it seems that this may be coming to fruition and hope this is just the first. To get a 5.1 mix to get two discs of session tapes, I just cannot wait. Will preorder the super deluxe the moment it is available. Cannot wait. I pre-ordered the Super Deluxe 6 disc & 2 disc version for my collection. Amazing looking set and I'll probably finish going for the Deluxe 6 pack at £140 smackers. Tad disappointed they didn't include SFF and PL onto the Remix LP as they sort of alluded to via the press. (Mr McCartney?) I was looking forward to how the track listing would have worked out. Just have to mock up my own version and throw OANS in the mix from Yellow Sub Songtrack. Amazon Italy have this cheaper than Amazon UK: 98 Euros. Of-course the UK price may fall before release. what a total rip off. £100??? seriously? I hope this is a huge seller so Apple will give other albums the deluxe treatment.